Our fantasy wrestling profiles capitalize on the similarities between pro wrestling, comic books and role-playing games. They imagine a world where the wrestlers are their characters, have powers matching their persona and signature moves, and are important players in crime or crime-fighting. Some profiles postulate a “pro wrestling universe” (like the Marvel or DC Universe), while some keep things generic enough to be plugged into existing fictional universes. For more about tabletop role-playing games, see our relevant FAQ. Other Aliases: “The Big Red Machine”. Known Relatives: Paul Bearer (father), Marie (mother, deceased), Undertaker (half-brother). Base Of Operations: Shadowside district of Federation. Height: 7’ Weight: 326 lbs. His veins coursing with mystic energy, Kane is an almost stoppable force of destruction. An intimidating presence already, the aura of pure fear that surrounds him frightens most away. Possessing a subtle control over flame, he usually uses his powers to cause flame to spurt from small igniters he carries with him. Kane’s first memories are the flames which took his mother’s life. Kane was raised by Paul Bearer completely unaware that Bearer was responsible for his mother’s demise. Or even that Bearer was his father. Eventually, Bearer brought Kane against the renegade Undertaker. Kane, thoroughly under Paul Bearer’s mystic control, trounced his brother, apparently destroying him. 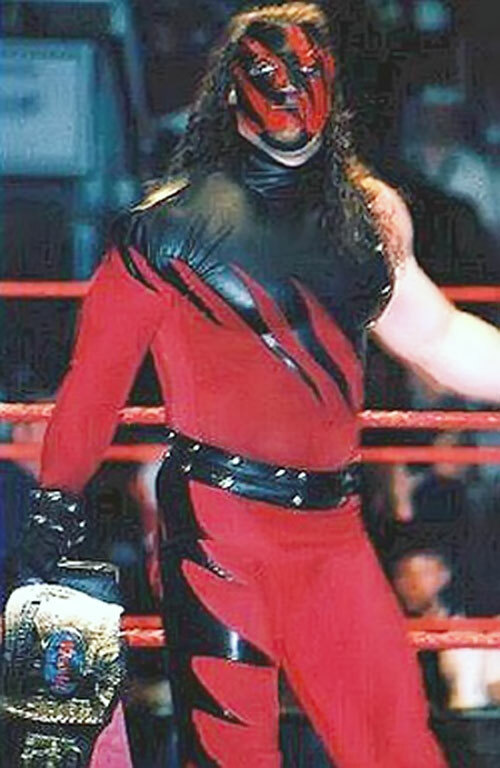 For the next year, Kane served as Bearer’s personal engine of destruction, until Undertaker returned. Not only did Undertaker defeat Paul Bearer, he managed to free Kane of Bearer’s control. His mind his own for the first time in his life, Kane helped his brother, The Rock, Chyna, and Chris Jericho bring down World Corp. During the battle, he encountered the D-X-er Tori and instantly, he was smitten. Tori escaped and Kane tried to settle into his new life. A month later, Kane encountered Shane McMahon’s Coalition for the first time. The Big Show utterly dismantled him in battle. Captured, Kane once again encountered Tori, who served as his guard. Tori showed compassion for the Big Red Machine, but Chris Jericho seriously injured her in the Superstars’ final battle with the Coalition. Kane rebelled against his brother, declaring himself a monster. Kane attacked both Undertaker and Y2J several times in the next several months. But that was only to learn that he was once again being manipulated by Paul Bearer and Vince McMahon. He teamed with Undertaker once again to take down Vince. The two brothers have since became almost inseparable companions. Personality isn’t Kane’s strong suit. Having only learned how to speak a little over a year ago, Kane has the emotional equivalence of a teenager at best. Fiercely loyal to his brother and Sara, he will do anything for them. Kane could be used in almost any campaign as a thug for a mystic villain. He might be used as a thug for Wodan or Mordru with little change. Area Knowledge (Shadowside), Iron Nerves. Serious Rage, Strange Appearance, Traumatic Flashbacks (being entrapped by flame). Source of Character: WWF and my own WWF Superstars universe.